Railpictures.ca - Marcus W Stevens Photo: With shows at both Milton and Hamilton behind them. 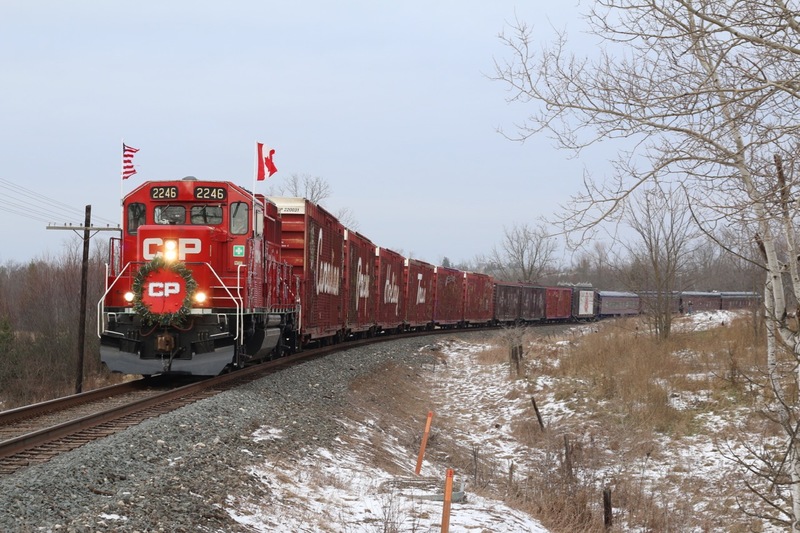 The annual CP “Holiday Train” (American Train) is rolling westward towards its first show of the day at Galt. Train 246 is holding on the main up ahead at Puslinch as the “Holiday Train”prepares to take the siding briefly before continuing on. The sweeping curve here at Victoria Road allows the whole train to fill the frame. A few spectators have taken to the hill in the background to take in the festive view. | Railpictures.ca – Canadian Railway Photography – photographie ferroviaire Canadienne. Caption: With shows at both Milton and Hamilton behind them. The annual CP "Holiday Train" (American Train) is rolling westward towards its first show of the day at Galt. Train 246 is holding on the main up ahead at Puslinch as the "Holiday Train"prepares to take the siding briefly before continuing on. The sweeping curve here at Victoria Road allows the whole train to fill the frame. A few spectators have taken to the hill in the background to take in the festive view. I agree there are some great angles here with a little pruning. Bill needs to convince the property owners to clear sight-lines for train photography. Those trees have got to go. Just the ones near the property line I’m sure we could all chip in a few bucks?? OH Arnold. You would be correct. The Mrs and I were up to our ankles in mud! I’ve always liked this spot and probably haven’t shot here since the frame train dissapeared. I think this is the best location you could have picked along the GALT.